A vintage Mexican TV Selecciones guide issued in 1966. 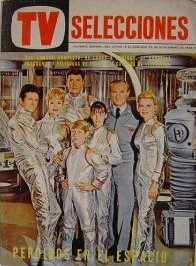 Cover features the classic cast of Lost in Space aboard the Jupiter-2 spaceship. There is no article within the TV guide pretaining to Lost in Space. Inside articles include, ELIZABETH MONTGOMERY, DAVID McCALLUM, ROBERT STACK, and ELVIS PRESLEY. Guide measures 8.5 x 5.5 inches approx.